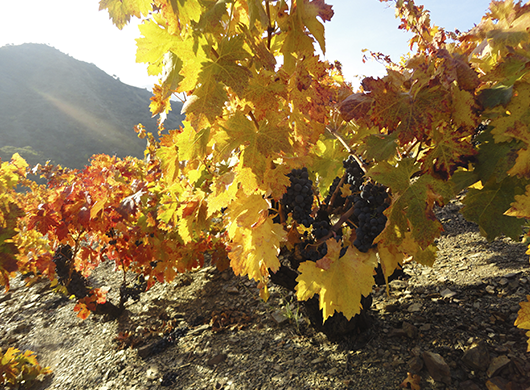 Vine cultivation is distributed at altitudes ranging from 100 meters above sea level in the lower parts of the districts of Bellmunt del Priorat and el Molar, up to 750 meters in the highlands of La Morera de Montsant and Porrera. The winegrowing is characterised by slopes that have a gradient of more than 15% in most cases although some wine estates reach 60%. Born of the soil and the region’s specific climate, vines planted here tend to suffer and as a result harvest yields are very low – at less than 1 kg per plant on average. This however means that the wines produced in this area have a very unique personality. The harvest period tends to last a long time: it starts around the middle of September in Bellmunt and El Lloar and continues until the end of October or the beginning of November in Porrera and La Morera de Montsant. The long fermentation period of very ripe grapes enables winemakers to obtain a series of very rich components from each grape, facilitating a very comprehensive skin maceration period.